Protesters at Mill Brook Houses, demanding investment from the city for long-overdue repairs. Photo by Trevor Boyer. On May 14, organizers from Metro IAF affiliate South Bronx Churches led Councilman Rafael Salamanca through two NYCHA apartments in his district that exemplify worst of the city’s public housing, one in Union Avenue Consolidated and the other in Melrose Houses. 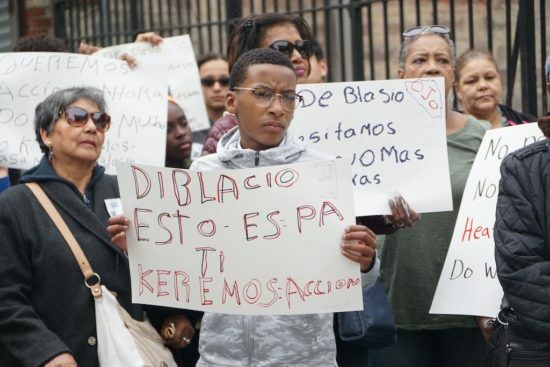 Calling NYCHA “the biggest slumlord in the city,” Salamanca echoed the activists’ demands, calling upon Mayor Bill de Blasio to allocate $2.5 billion more toward public housing at a rally in Melrose after the tour. He also said that he learned during recent council hearings that NYCHA employees are not subject to annual performance evaluations. “They do not hold their employees accountable, and that is why you are all living in these conditions,” he said. Salamanca touted the City Council’s response to the mayor’s preliminary budget. The council is asking for an additional $2.5 billion for NYCHA: $950 million for boiler and other heating repairs, $500 million for the development of more senior housing, and $1 billion for ongoing capital needs. Currently the mayor’s preliminary budget sets aside $200 million over the next three years to fix the worst heating systems in NYCHA developments, and $9.3 million for mobile boilers. The preliminary budget also notes the $1.9 billion his administration has allocated for NYCHA capital needs from 2014 to 2027. The two sides will need to come to an agreement on the final budget, which is due before the 2019 fiscal year starts on July 1. The need for capital improvements was apparent in Maria Ortiz’s Union Avenue Consolidated apartment, on Eagle Avenue in Woodstock, when she moved in seven years ago. The baseboard in her kitchen was missing. An adult could stick an arm into two of the holes in bedroom walls. In her shower, a four-by-four square of missing tiles exposed pipes and left a hole large enough for rats to crawl through. So far, though, it’s just been cockroaches and mice – too many for her cat to handle, she said through a translator. Three of her six grandchildren, who live in the apartment and range in age from six to 16, have asthma. Rodent and roach feces trigger asthma attacks. Ortiz has been raising her grandchildren for the last four years, since her daughter, the children’s mother, died of cancer. Her sick daughter often struggled in the cold when the apartment’s heat would go out, she said. During the past winter’s brutal cold, Ortiz racked up an $800 electric bill by using space heaters when the development’s boiler was offline, she said. In Melrose Houses on East 153rd Street, Norma Nizario had called in “tickets” to the NYCHA complex’s managing office for the crack that spanned the length of her living room ceiling, to no avail. Roaches scurried in and out of a crack in her kitchen wall. A bloom of mold covered much of her bathroom ceiling, and Nizario said that NYCHA maintenance employees had done nothing more than paint over it. Within days of the Councilman’s visit, however, NYCHA repairmen came and made the repairs to Nizario’s apartment and replaced the tiles in Ortiz’s bathroom. After the tour, South Bronx Churches held a rally in front of a vacant NYCHA-owned lot on E. 152nd Street, a block from Melrose Houses. South Bronx Churches has asked NYCHA to build senior housing on the lot. A leader of Metro IAF, Fr. Francis Skelly of Immaculate Conception Church in Melrose said that the vacant lot could host a building with about 100 units for seniors. Empty-nesters from under-occupied NYCHA apartments could move to these new units and free up their own apartments for larger families to fill, he said. 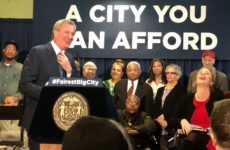 In December, the city’s Independent Budget Office estimated that almost a third of NYCHA’s 176,000-plus apartments are currently under-occupied. 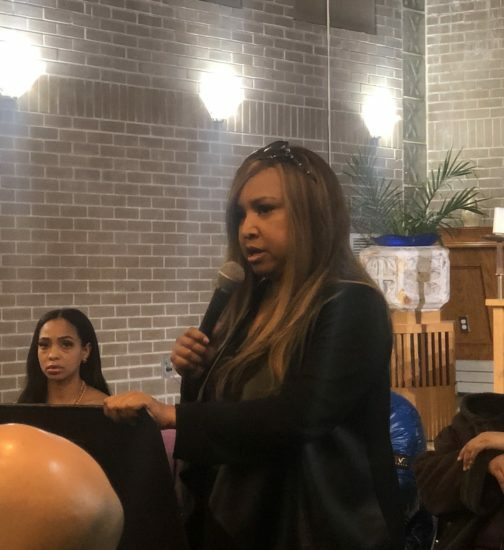 “We are committed to increasing affordable housing in the city, using underused NYCHA land,” said Munt, the NYCHA spokeswoman, adding that the Authority is currently reviewing proposals to turn three other properties in the city into senior housing. 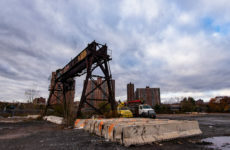 Metro IAF’s lead organizer Grant Lindsay said the reason NYCHA isn’t moving to develop the E. 152nd Street lot is simple: “Just competence,” he said.